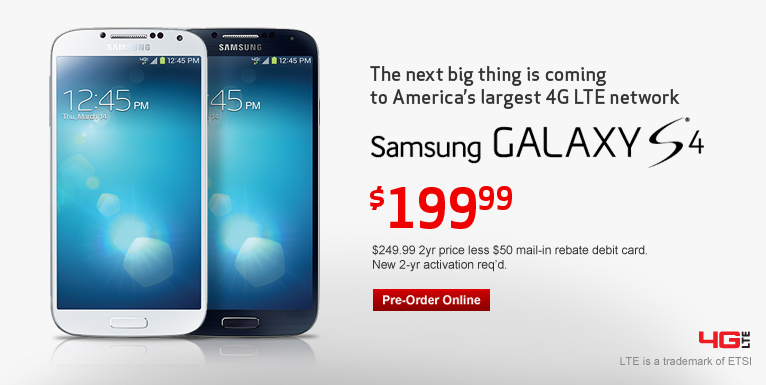 Verizon Opens Up Pre-Orders For The Samsung Galaxy S4! The day has finally come! Verizon has opened up pre-orders for the Samsung Galaxy S4. You may have a bit of trouble getting the order page to load as it is being flooded with traffic at the time. If you decide to order over the phone you will be holding for a while as well. The phone will set you back $199 on a 2 year contract or $649 if you buy it outright! I have ordered mine and was told that it would ship by May 30. That is a full month after everyone else gets it. Oh well. Who else is pre-ordering this phone?